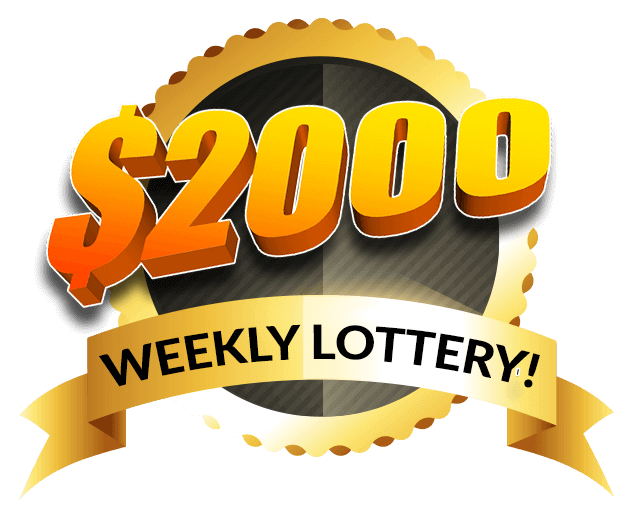 Play a free bitcoin lottery and win up to $2,000 in BTC. Sign up, earn or buy lottery tickets online and be a part of the biggest bitcoin lotto on the internet. Welcome to the Freebitco.in lottery – a lottoland full of free BTC prizes and rewards! HOW DO I PLAY BITCOIN LOTTERY? These are some questions that might be racing through your head right now. We’ll answer them all. The Freebitco.in Bitcoin lottery is a provably fair online lotto that takes place every week on the Freebitco.in website. Where 10 lucky users stand a chance to win up to $2,000 in free bitcoins every week. Entering the lottery is easy – all you need are one or more lottery tickets that make you eligible to participate. There are several ways to get yourself those lucky tickets, and once you do, the system automatically enters you into the draw. What Time Is the Lottery? Every Monday, the weekly lottery starts at 00:00 UTC. All the lottery tickets you earn or buy after that are eligible until the lottery ends on the following Sunday at 23:59 UTC. The provably fair system picks 10 winners at random and the corresponding BTC prizes are directly transferred into their Freebitco.in wallets. Where to Buy Lottery Tickets? On the Free BTC page, you get free spins for free bitcoins every hour. All you have to do is solve the captcha and hit roll. For every free roll, you get 2 lottery tickets. These lottery tickets are automatically added to your ticket total and you’re entered into the draw. Freebitco.in has a comprehensive referral program, and one of the benefits of referring your friends to the website is that you get 1 lottery ticket for every free spin your referrals roll on the Free BTC page. The tickets you earn from your referrals are automatically added to your ticket total and are eligible for the draw as well. The Multiply BTC page takes you to the in-house HI-LO dice game, where you get 1 lottery ticket for every 1000 satoshi bet or 0.00001000 BTC you wager on the game. This is the easiest way to get a massive amount of lottery tickets on-the-go. If you’d like to add to your ticket total further, you can buy lottery tickets on the lottery page on the Freebitco.in website. A ticket costs 2 satoshi or 0.00000002 BTC, and there are no limits to the number of tickets you can buy. How to win the Free Bitccoin Lottery? The ‘Your Tickets’ section, of course, tells you your personal lottery ticket total. 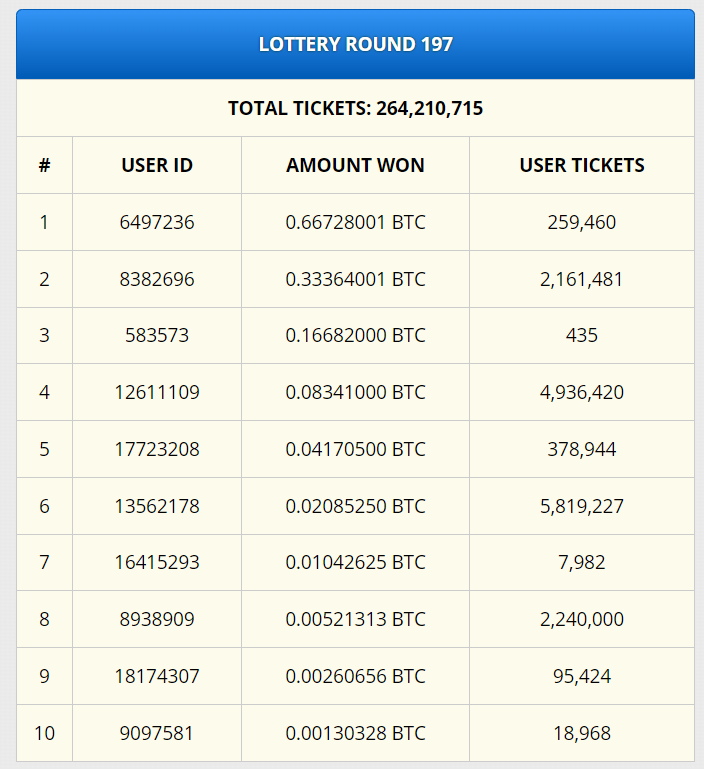 The ‘Total Tickets’ section tells you the total number of tickets that are actually in the pot, and the ‘Win Chance’ section calculates your chance of winning in the bitcoin lottery. To have a better chance at winning, accumulate the highest number of tickets possible for you during the week. The higher the number of lottery tickets you have, the higher your chances of winning the bitcoin lottery. How Does Bitcoin Lottery Work? 1. At the beginning of each round, we generate a server seed for that round and show you the SHA256 hash of this seed. 2. When a lottery round has concluded, we make a list of all user id’s and their lottery tickets and sort it in ascending order of the user id’s. 3. We then use this list to assign ticket numbers for all tickets. For example if user id 1 has 10 tickets and user id 2 has 20 tickets, then user id 1 will have ticket numbers 0 to 9 and user id 2 will have ticket numbers from 10 to 29. This is done for all users. 4. Then the list containing the user id’s, tickets held by each user and their ticket numbers is published in a text file. This file also contains the total number of tickets issued in the round and the server seed for that round. 5. A MD5 hash of this text file is calculated. 6. Then the current bitcoin block number is recorded and a block number that is 12 blocks into the future is decided on. The block hash of this future block is used as a “client seed” ie. a seed that we are not aware of when the list in step 4 has been published. 7. Then a tweet is made via our twitter account (https://twitter.com/freebitco) containing the link to the file generated in step 4, the MD5 hash of the file and the future bitcoin block number as determined in step 6. Since tweets cannot be edited, only deleted, this will provide a timestamp for when the list in step 4 was made, which can be compared to check that the bitcoin block determined in step 6 is in the future ie. we do not know the block hash of this block when the list is generated. A string (STRING1) is created – “[SERVER SEED]:[BLOCK HASH]:[WINNING POSITION]”. The SHA256 hash of STRING1 is calculated and the first 8 characters of this hash are taken (STRING2). STRING2 is converted to a decimal which gives us a number between 0 and 4,294,967,295 (NUM1). NUM1 is then multiplied by the (total number of tickets minus 1) and divided by 4,294,967,295 to get a number (NUM2) between 0 and the total number of tickets less 1. NUM2 is then rounded off to the nearest whole number which is the winning ticket number. The [WINNING POSITION] starts at 1 and is increased by 1 for picking the 10 winners. The user having the ticket with the lowest [WINNING POSITION] wins the first prize and so on. If a user wins more than 1 prize, the number is discarded and [WINNING POSITION] is increased by 1 and the calculations are run again to pick a new user. This is to ensure that a user cannot win more than 1 prize in a round. (NUM2) between 0 and the total number of tickets less 1. How is the system Provably Fair? 1. We provide a SHA256 hash of the server seed when a lottery round starts. If we change the server seed at any time, the SHA256 hash of the new seed will not match the hash we provided earlier. After a round has ended and we provide the server seed that will be used to pick winners, the hash of the seed we provide can be checked against the hash we provided originally and both should match. 2. We use a future bitcoin block hash as the “client seed” ie. a seed that we do not know of. All bitcoin block hashes are unique and nobody knows what the block hash of a future block will be until the block has been mined. 3.We use twitter to publish the future bitcoin block number, the list of users and their ticket numbers and the MD5 hash of the user list. It provides a timestamp to check if the block hash that we use is indeed in the future. Since tweets cannot be edited, only deleted – if we delete the tweet after the future block has been mined and publish a new one, it would be easy to catch us cheating by comparing the timestamp of the tweet and that of the bitcoin block. The timestamp of the tweet should always be lesser than the time timestamp of the bitcoin block whose hash is used as the client seed. 4. We provide a MD5 hash of the text file containing the list of users and their ticket numbers. If even a single character in the text file is changed after the MD5 hash in the tweet is published, the MD5 hash of the edited file will not match the MD5 hash provided in the tweet. How do I check the Lottery Results? At the end of the week, at 23:59 UTC on Sunday, all your lottery tickets will be entered into the draw. The process mentioned above will determine 10 random winners, with the top winner earning up to $2,000 in BTC. Scrolling down on the Lottery page, you’ll find the leaderboard that shows the top 10 winners of the week. Currently, Lottery Week Number 198 is in process, and below you can find the leaderboards for all previous weekly lotteries with their corresponding winnings. Scroll through them and see what you are in with a chance to win every week! Meta description of the page should include free weekly lotto and win your way upto $2000 in Bitcoin lottery every week for free .